READY TO CAMP package–Motorhome 2004 38’ Adventurer 63,000 one owner, no smoke or pets plus Towable Car (2005 Buick LaSabre Limited, one owner, 105,000 and all the “stuff” needed to GO! “Stuff” includes 4 lawn chairs, large outdoor carpet, Coleman grill, linens (bath & bed), cooking utensils, tableware, + more. MIGHT SELL RV SEPERATELY. MOTORHOME: Always garaged when not used, hand polished each year, no paint fade, Allison transmission, height 12.5’, 5000# hitch, Blue Ox towbar, BrakeBuddy, stainless wheel liners, Michelin 22.5” tires, hydraulic leveling jacks, trac bar, TRU-Center steering assist, 2 slideouts (queen bedroom & 14‘ Rest Easy lounge & dinette), CAB: driver’s door, power window, adjustable leather seats (driver 6-way power), tire pressure monitoring system, rear monitor TV, auxiliary start circuit, light filtering shade, defrost fans, passenger side in-dash work station, electronic compass w/thermometer. EXTERIOR: One piece fiberglass rear cap, one piece fiberglass roof, fiberglass sides, ladder, roof luggage rack, 3 Storemore sllideout storage compartments, 3 basement storage compartments, 20’ patio awning w/ metal cover, electric defrost mirrors, dual glazed tinted windows, auto electric entrance step, exterior wash station w/hand held shower head, exterior entertainment center w/CD, duplex 110V outlet. INTERIOR: Textured fabric ceiling, cherry wood finish, 5’ wide wardrobe/closet w/mirrored doors, 3’ wide wardrobe/closet w/mirror, solid countertop, 3 burner range top, microwave/convection oven w/fan, Norcold double door refrigerator/freezer, Everpure water filter, wall mount in-bath hair dryer, shower/tub w/light & skylight, hand held shower head, fluorescent ceiling & galley lights, pantry, Rest Easy multi position lounge, moveable hoop-base reclining lounge chair, one place systems monitor panel, bath & galley vinyl floor, convertible-to-bed dinette, day/night pleated blinds, vanity converts to computer/desk work station. SYSTEMS: 7KW Onan generator, 50A electric system, electrical management system, 300W DC/AC inverter, 45 amp battery charger, 10 watt solar battery charger, battery disconnect system, 2 coach deep cycle batteries, DishPro satelite system, Winegard satellite system, TVs 24” flat front /19” rear, AM/FM/CD/DVD stereo DLX Q-surround sound, CB radio, city/freshwater tank diverter valve, Culligan water filter, 28 gal LP tank, 10 gal LP/motor aid water heater, 40,000 BTU LP floor ducted furnace, TrueAir basement mounted heat pump ceiling ducted air conditioning/heat, holding tank flushing system, heated holding tank compartment, 53 gal black holding tank, 55 gal grey, water system winterization system, plumbed for washer/dryer. SAFETY: GFI electrical outlets, CO2/LPG & smoke detectors, 10BC fire extinguisher, 3 point shoulder/lap seat belts, lap seat belts in lounge sofa.  2003 Winnebago Adventurer 38G, Stock #114850 - This is one beautiful RV! All the amenities of the home on wheels! Low hours!!! Still needs to be broken in! If you are in the market for a class a, look no further than this 2003 Adventurer 38G, just reduced to $45,900. This Class A is located in Panama City, Florida and is in great condition. She is also equipped with a Chevrolet engine that has 59,600 miles. We are looking for people all over the country who share our love for boats/RVs. If you have a passion for our product and like the idea of working from home, please visit SellBoatsAndRVs [dot] com to learn more. Please submit any and ALL offers - your offer may be accepted! Submit your offer today! Reason for selling is no time to use!. Icemaker (Large), Microwave/convection Oven, Propane Gas Tank, Refrigerator (Double Door), Stove, Fridge/freezer (4 Door), CD Player, DVD Player, Satellite Dish, Surround Sound System, TV (LED), Air Conditioning (Central), Queen Bed (Two), Shower (Large), Skylight (Bathroom), Slideout (Two), Sofa (Power), Vanity (Bedroom), Washer Dryer Hook Up, Central Heat, Dining Table, Coach Batteries (2), Hitch, Solar Battery Charger, Awning (Two), Driver's Door (Yes), Exterior Speakers, Exterior Stereo, Smoke Detector, Workhorse Chassis, Fiberglass Construction, Automatic Transmission, 2-Axle, 2 Side Doors, Waste capacity: 53 gals, Gray water capacity: 55 gals, Width: 8' 6", Height: 11' "This is one beautiful RV! All the amenities of the home on wheels! Low hours!!! Still needs to be broken in!" 2019 Winnebago Adventurer 33C, Winnebago Adventurer class A gas motorhome 33C highlights: Outdoor Entertainment TruComfort + Sofa Four Door Refrigerator And Freezer Dining Table And Chairs Whether you're traveling across the nation or planning a weekend getaway, this motorhome is perfect for you. With room for five, you'll make memories to last a lifetime. This unit features a TruComfort + sofa, allowing the young kids a place to sleep. Everyone will love the glide and dine dining table with chairs, which allow family meals just like home. With a four door refrigerator/freezer with an icemaker, and a pantry, you won't have to stop to fill up on food until you're heading home! This model also features double sliding doors to the bedroom with a queen bed, a wardrobe, and an 32" HDTV to enjoy late night movies. Enjoy a flexible showerhead, and a medicine cabinet, plus a linen closet in the bath. This unit includes an outdoor entertainment center, plus much more. Come check it out today! In every Winnebago Adventurer class A motorhome you will find a double stainless steel sink, and a three burner cooktop. Each unit also features a bathroom skylight to make you feel right at home, and an optional powered loft bed. These motorhomes include ample storage areas, plus lighted storage compartments, making packing a breeze. Each model includes a powered patio awning with LED lighting, a pet leash tie down, and automatic entrance door steps. Constructed with a premium high-gloss fiberglass skin, and a Triton engine, the Winnebago Adventurer has been made to last. Come choose the best floorplan for your lifestyle today! 2019 Winnebago Adventurer 33C, Winnebago Adventurer class A gas motorhome 33C highlights: Outdoor Entertainment TruComfort + Sofa Four Door Refrigerator And Freezer Dining Table And Chairs Whether you're traveling across the nation or planning a weekend getaway, this motorhome is perfect for you. With room for five, you'll make memories to last a lifetime. This unit features a TruComfort + sofa, allowing the young kids a place to sleep. Everyone will love the glide and dine dining table with chairs, which allow family meals just like home. With a four door refrigerator/freezer with an icemaker, and a pantry, you won't have to stop to fill up on food until you're heading home! This model also features double sliding doors to the bedroom with a queen bed, a wardrobe, and an 32" HDTV to enjoy late night movies. Enjoy a flexible showerhead, and a medicine cabinet, plus a linen closet in the bath. This unit includes an optional washer/dryer hookup, an outdoor entertainment center, plus much more. Come check it out today! In every Winnebago Adventurer class A motorhome you will find a double stainless steel sink, and a three burner cooktop. Each unit also features a bathroom skylight to make you feel right at home, and an optional powered loft bed. These motorhomes include ample storage areas, plus lighted storage compartments, making packing a breeze. Each model includes a powered patio awning with LED lighting, a pet leash tie down, and automatic entrance door steps. Constructed with a premium high-gloss fiberglass skin, and a Triton engine, the Winnebago Adventurer has been made to last. Come choose the best floorplan for your lifestyle today! 2019 Winnebago Adventurer 35F, 2019 Winnebago Adventurer 35F. 362 HP, Exterior protective front mask, Loft bed, Video camera system, Microwave/Convection, Defroster aux fans, 2 hi effeciency AC heat pump, RR valve stem. This motor home has function plus style and you'll be proud to call it your home away from home. It will make you fall in love with your spouse all over again as you discover the countryside together. The Adventurer is roomy and open and large enough to entertain guests. It also has ambiance for those many romantic nights ahead. Enjoy the comfort of a large bed and wardrobe as well as a chester drawers so you can be prepared for any event. Enjoy an intimate dinner for two at your dinette table or snuggle up on your oversized Ultraleather couch for a movie night. Enjoy making meals together in your open concept kitchen with a large refrigerator and sleek glazed Honey Cherry wood finishes on all of the cabinets. Imagine the new adventures you and your love will share together in luxurious surroundings of your new motor home. You must see the open floor plan and the storage available! Come by and visit with our friendly staff on financing or taking a trade to get you started on your next great adventure! Call 1.888.412.5711 for more information. Trades welcome. Financing available! Photos for illustration purpose only. 2019 Winnebago Adventurer 27N, Winnebago Adventurer class A gas motorhome 27N highlights: Three Slides Double Door Refrigerator 50" HDTV Three Burner Cook Top This motorhome has everything you need for your next big vacation. With room for five, you can be sure to have a great time with family and friends. This unit features a sliding door leading to the bedroom with a queen bed with an innerspring mattress and storage below, and a 24" HDTV. Bring along all your dry goods and ingredients for a home cooked meal with a pantry, and a double door refrigerator and freezer in the kitchen. This motorhome also includes three slides, giving you and your guests plenty of room as if you were home. You'll love the bathroom with decorative backsplash, a flexible showerhead, and a linen closet for all your necessities. Enjoy all the amenities this model has to offer, including, a 50" HDTV, a microwave oven, an outdoor entertainment center, plus much more! Adventure is calling your name, hurry in today! In every Winnebago Adventurer class A gas motorhome you will find a double stainless steel sink, and a three burner cooktop. Each unit also features a bathroom skylight to make you feel right at home, and an optional powered loft bed. These motorhomes include ample storage areas, plus lighted storage compartments, making packing a breeze. Each model includes a powered patio awning with LED lighting, a pet leash tie down, and automatic entrance door steps. Constructed with a premium high-gloss fiberglass skin, and a Triton engine, the Winnebago Adventurer has been made to last. Come choose the best floorplan for your lifestyle today! 2019 Winnebago Adventurer 30T, Winnebago Adventurer class A gas motorhome 30T highlights: TruComfort + Sofa Buffet Dining Table And Chairs Outdoor Entertainment Center This motorhome is perfect for the family of five seeking adventure. Featuring a TrueComfort + Sofa, which allow the little ones a fun place to sleep, and a dining table with chairs to enjoy a family meal, you'll feel right at home. This unit includes a bedroom with a queen bed, a 24" HDTV, and a storage cabinet for all your valuables. The chef in the family will love the kitchen with a 7.5 double door refrigerator, a touch control microwave/oven, and a flip-up countertop extension, that gives extra space to prepare a big breakfast. The bathroom includes a flexible showerhead, a textured glass shower door, and towel rings. What more can you ask for!? In every Winnebago Adventurer class A gas motorhome you will find a double stainless steel sink, and a three burner cooktop. Each unit also features a bathroom syklight to make you feel right at home, and an optional powered loft bed. These motorhomes include ample storage areas, plus lighted storage compartments, making packing a breeze. Each model includes a powered patio awning with LED lighting, a pet leash tie down, and automatic entrance door steps. Constructed with a premium high-gloss fiberglass skin, and a Triton engine, the Winnebago Adventurer has been made to last. Come choose the best floorplan for your lifestyle today! 2019 Winnebago Adventurer 30T, Winnebago Adventurer class A gas motorhome 30T highlights: TruComfort + Sofa Buffet Dining Table And Chairs Outdoor Entertainment Center This motorhome is perfect for the family of five seeking adventure. Featuring a TrueComfort + Sofa, which allow the little ones a fun place to sleep, and a dining table with chairs to enjoy a family meal, you'll feel right at home. This unit includes a bedroom with a queen bed, a 24" HDTV, and a storage cabinet for all your valuables. Mom will love the kitchen with a 7.5 double door refrigerator, a touch control microwave/oven, and a flip-up countertop extension, that gives extra space to prepare a big breakfast. The bathroom includes a flexible showerhead, a textured glass shower door, and towel rings. Bring along an extra TV with this model including an outdoor entertainment center, complete with a removable TV table, an AC/DC receptacle, and a portable satellite dish hookup. What more can you ask for!? In every Winnebago Adventurer class A gas motorhome you will find a double stainless steel sink, and a three burner cooktop. Each unit also features a bathroom syklight to make you feel right at home. These motorhomes include ample storage areas, plus lighted storage compartments, making packing a breeze. Each model includes a powered patio awning with LED lighting, a pet leash tie down, and automatic entrance door steps. Constructed with a premium high-gloss fiberglass skin, and a Triton engine, the Winnebago Adventurer has been made to last. Come choose the best floorplan for your lifestyle today! 2019 Winnebago Adventurer WFF35F, Get ready for an adventure in a 2019 Winnebago Adventurer 35F. This Adventurer Class A comfortably sleeps 7. And a master bedroom conveniently located in the Center. 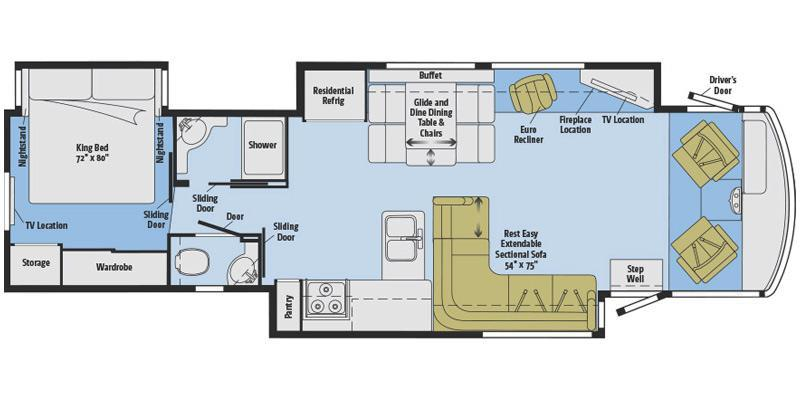 RV Living in the Adventurer Class A has never felt more like home, with convenient amenities like a Front kitchen with Bench Seats, Center living area and Rear / Center bathroom. To enhance your traveling experience, the Adventurer 35F Class A also features a stove with 3 oven burners, Full-Size refrigerator, 3 TVs, Standard Fireplace and more. This Adventurer 35F, has a GVWR of 22000 lbs . It also offers 2 Black Water Holding Tank(s), 1 Fresh Water Holding Tank(s), and 2 Gray Water Holding Tanks. This Adventurer has 1 door(s), 1 awning(s), 2 slideout(s). 2015 Winnebago Adventurer 35P, This Winnebago Adventurer model 35P is a class A that will make any trip enjoyable. Step inside and see the generous space inside, plus all the amenities you need and want while away from home.As you enter notice the BenchMark dinette slide out on the right side. There is a 47" HDTV located to the left of the door at an angle for perfect viewing from any seating in the space.The full wall slide starting behind the driver's seat features a rest easy sofa, double kitchen sink, three burner range, 4 door refrigerator, storage cabinet that is also the location of the optional washer and dryer, plus the slide continues to the rear ending with a chest of drawers and TV location for 32" HDTV.Along the door side find a complete bath featuring a toilet, vanity with sink, kidney shaped tub/shower, plus storage.Double sliding doors lead into the rear master suite with a king bed slide, or optional queen. Along the rear wall find a wardrobe, storage cabinet, plus so much more! You can also choose the optional chassis with 24,000 lb. GVWR if you wish. 2014 Winnebago Adventurer 38Q with ONLY 19,585 miles! Garage kept! Excellent condition! This is a great RV that we have used over the past few years to travel. Looking to give another family the opportunity to travel in style and with maximum comfort! Some amenities include: - Automatic satellite Television system. - Fireplace - Surround Sound/DVD Home Theatre - NAV System - Premium Leather couch, recliner and driver/passenger captain chairs - Full size stainless refrigerator - King Bed with adjustable mattress firmness - Bathroom with shower and vanity - Bathroom with toilet and vanity - Stacked washer/dryer - Electronic patio shade - Rear window awning - Contemporary design - Gas stove and convection microwave - 5KW gas generator - Glide and dine dining table and chairs - Outdoor entertainment with television - Pull out pantry - LOTS of storage capacity - Installed back up lightsAND many more features! Feel free to ask any questions! 2 Year transferable warranty with engine, transmission, chassis and coach coverage. 2012 Winnebago Adventurer 35P. Ford V-10 Engine on a 22,000 pound chassis with new Michelin tires and Alcoa aluminum rims. Beautiful full body paint (no decals to face or peel) No expense spared on this motorhome. Top of the line features, tile floors, corian countertops with tile backsplash, deluxe cabinetry, King bed, LCD flat screen TV and deluxe entertainment center, four door refrigerator with ice maker, MCD shades with separate solar screen and black out shades, power sun visors for driver and passenger, power front privacy shade, auto hydraulic levelers, swivel ultra leather cab seats, passenger seat with foot rest and recliner, drivers door, chrome mirrors with built in side cameras, color back up camera with sound, dual ducted roof air conditioners, 5,500 watt Onan generator, power patio awning with metal encasement, slide out toppers on all slides with metal encasement, heated basement storage (four seasons), and so much more. Please call or text for more info about this beautiful motorhome. 940-353-0101.We pride ourselves on personalized service. Call us with any questions or request. Want a specific photo or video?…. Just ask. Each RV is delivered with a full tank of fuel and propane. Batteries are inspected and replaced if needed. Our RV’s are inspected by a third party technician for your peace of mind, and we provide a one on one orientation where we teach you how to use your new RV. We appreciate the opportunity to help you. We love teaching, living and sharing the RV Lifestyle. This Rare 2008 R Winnebago Adventurer Limited 37GL is an efficient gas pusher. FINANCING AVAILABLE. It has a GM Vortec 8.1 L, 454 HP, 340 cc engine with a 2 year or 100,000 mile warranty. A Allison 2100 series transmission with 6 speed 2 overdrive gears; Mileage 48,000; 145 amp alternator, 4-wheel ABS, Trailer hitch 5,000 lb, drawbar/500 lbs. Wheel liners stainless steel. It is in top running condition with a new radiator, starter and batteries.This gas pusher allows a turning radius which gives great flexability when manuvering those tight rv sites. This coach features fully automatic leveling jacks, full body paint, encased power patio awning, large shower, new samsung flat screen television. It is equiped with a double door refrigerator with an ice maker, a microwave/convection oven and a 5500 watt onan gasoline generator, home theater sound system, corian counter tops, hard wood cabinets throughout. We have stored our unit inside and it has been very well maintained. W24 workhorse GM 8.1 Gas V8Allison Transmission. Full size tires 23.5 Michelin tire’s mounted in 2017 Aluminum rims. Tires are under 8000 miles. 16” powered awning. Rear view camera and side view Camera’s. Oman 5.5KW gas generator generator with 289 hrs use. Generator has an exhaust stack to direct exhaust fumes above roof. Amp 30 Amp & 20 Amp male power adaptors. Whole coach water filter. Sani flush system. Outside Remote controls for water pump auto leveling and light. Clear sight for draining black and gray tank with three separate valves. 10 gallon DSI water heater. Added awning screen for more shading. Leveling blocks. Outside windshield cover. Interior includes the following: Powered Drivers seat. auto leveling system. Transmission brake control and overdrive three speed selection control. Starter boost in the event that the chassis battery is down. Engine coach heating is available. Generator starting from driver seat Fog lights. Heated and electrical controlled mirrors. Jensen sound system with switch for interior TV or radio and power choices. Drivers side door with power window. Power driver and passenger shades. Defrost fans. Control center provides power management system of use of 5.5w gas generator/ shoreside 50 amp 220v, 30 or 20amp 120v to prevent circuit overloading. Hours Meter reflects 289 hours on generator. Cherry wood cabinets through out coach. 7 foot high ceilings. Euro chair with foot stool. Powered love seat converts into Bed or use use of two ottomans. Powered steps. Most of the interior has either LED or fluorescent lighting to conserve power. 600W power inverter to power front 32” LCD TV and some of the front outlets from coach batteries. Dinning area includes under-seat storage and converts into bed. The coach has a propane gas leak detection system. Two heating options are available: gas fired heater and residential type heat pump. AC heat pump is located below the coach to decrease overall noise levels. This feature provides also a clean roof line and ceiling. AC vents are located on the ceiling front to back. The gas heater or engine coach heater uses separate floor vents. 1500W convection oven microwave combination. Four door RV refrigerator with ice maker that will power from either electric or gas. Gas range. Stainless steel sink with dual function faucet/sprayer. Corian brand stone countertop. Filtered water faucet. Slide out pantry is located adjacent to refrigerator. Bathroom has porcelain commode. Shower stall uses safety glass enclosure panels/door. Sizable cedar lined closet space. Washer & dryer combo. Sleep number mattress with controls. Bedroom 32” LCD connected to the satellite system. Built in radio and CD player at bedside. Added features: 200W Solar panels to maintain coach battery. Satellite receiver and in motion Dish. 2007 Winnebago Adventurer 35A, Ford Super Duty 22,000 Lb. chassis, Triton V-10 362 HP engine, 69,200 highway miles on MOBIL-1 Oil, 5-Speed Automatic transmission, 22.5" Alcoa Alum. wheels, New (2017) Michelin tires, AM/FM/Stereo w/ SIRIUS Sat. Radio, Fog lamps, Chrome 2-speed windshield fans, Auxiliary start circuit, Rear cold weather heater package, Powered sunvisors, Driver's entrance door w/power window, Leather cab seats w/6-way driver's powered, Driver's entrance door w/power window, Leather cab seats w/6-way driver's powered, Benchmark dinette, Leather Resteasy powered sofa, Shower with light, Leather Euro recliner, Passenger side workstation, Powered/heated rear view mirrors, Rear vision camera w/side view, HWH computerized leveling jacks, 5,500 Watt Onan generator, True air central a/c w/2 electric heat pumps, 50 Amp power management system, Powered patio awning with metal cover, Microwave/convection oven, Large stainless front 4-door refrig. w/ice maker, Front 32" flat screen LED TV, Rear 26" flat screen LED TV, DVD player w/theater sound, 600 Watt DC/AC power inverter, Auto seek satellite dish, TV Antenna w/booster, 40,000 BTU furnace, Systems monitor panel, 10 gal. LPG/110V water heater, Water system winterization valve, Washer/dryer combo, Water purification filter, Fluorescent lighting package, Dual pane insulated windows, Day/night pleated blinds, Solid surface counter top, Vinyl galley & bath flooring, Aux. battery disconnect switch, Exterior entertainment center w/CD, 5,000 lb trailer towing package, Roof ladder, Exterior wash station, Enclosed heated holding tanks, Full body paint (Pearl II Exterior option), Sierra maple woodwork, Surge Guard power protector, LED lighting throughout, 50 AMP surge protector, New queen Sleep Number bed, New dinette upholstery, New (Dec 2017) carpet throughout, Non-smoker, Excellent condition inside and out. $75,900.00 with 2018 Ford Focus SE and Blue Ox tow bar system. Ready to tow. 2007 Winnebago Adventurer 38J, 2007 Winnebago Adventurer 38J Your Home On the Road. For 2007, the industry’s best-selling Class A motor home is even better. The moment you step inside the Adventurer you’ll notice the spaciousness created by the 7-foot-2.5-inch ceiling. The roomy coach is enhanced by our SmartSpace™ design philosophy, which makes the most of interior living areas by maximizing functionality and incorporating space-saving, user-friendly features. 2007 CLASS A Winnebago-39 ft.- Vin # 5B4MPA7G963416535 – LIKE NEW – ONLY 39% OF ORIGINAL COST! This unit has had only one other owner and was only driven 15k miles. It has $19.5k in factory upgrades. The two slides in the front create a massive living/entertainment area that is 10’ ft by 12’ ft. The third slide is in the master bedroom and creates a room that is 10’5’’ ft by 7’6’’ ft. There are several doors that separate the bathroom and bedroom areas from the rest of the motorhome, if privacy is a concern. It’s many features include a 4 door fridge/freezer, electric leather foldout couch, home theater surround sound system, sleep number air adjustable bed with two zones, washer and dryer, auto satellite system, remote control side awning, brake assist (I love this option), auto-leveling, Allison Automatic Transmission, full body paint, underbelly mounted large AC system, exterior entertainment center, Inside Power Inverter, 5.5kw Generator (Approx. 190 hrs. ), 5k tow hitch, a collision avoidance system with cameras on each side of the coach to make it easier to change lanes (allows you to see in the blind spots), driver’s door opens, electric sun shades, GAWR24k, 75 gal fuel tank, 88 gallon fresh water tank, 10 gal. water heater tank, 51 gal Black water tank, 53 gal. gray water tank, 28 gallon LP tank, and too many more to mention due to space. If you have interest, I’ll provide NADA worksheet that confirms the current value, as well as the factory build sheet that lists all standard features, upgrades and original pricing! I personally put 4k miles on this unit in the last 6 months, which gave me a chance to test all systems. Anything no working as intended was professionally repaired, including the addition of all new tires, as a safety precaution. This coach was originally listed at $174,138, including the $19k in upgrades. Current Low Retail, per NADA, should be $80.4K – Will sell for $69,999 for a quick sale! Please call me with any questions or if you wish to see more detail and/or pictures of the Coach. Also, we will pay up to 500 for your one way airfare to pick it up if you purchase it. Workhorse W22 Chassis, Allison 1000 5-spd transmission, 22.5" wheels. Basement/residential-style A/C. 900 hours on Onan 5500 genset. 50amp shore power connection. Full body paint. Sleeps 6. Fresh Water: 82 gal.Gray: 77 gal.Black: 51 gal.LP: 23 gal.Fuel: 75 gal. New LED lighting throughout. Oil changed every 3,000 miles since purchased. New awning. Old satellite dish removed (it was shot). Opposing slides make for roomy kitchen. Double-sided fridge with ice maker. Split bathroom has separate porceline toilet with washdown. Inline drinking water filter. Driver's side door is nice for refueling (and changing fuses). 2004 Winnebago Adventurer Model: 33V New Tires: 3/4/2019Class A Gas 33.5 FT WORKHORSE CHASSIS 4-Speed Transmission w/ OD Powered by GM 8.1LService Amps: 50Fuel: 75 Gallon Water: 80 Gallon Water Heater: 10 Gallon Black Water Tank: 50 Gallon Grey Water Tank: 45 Gallon TWO SLIDE OUTS Power Main Metal Encased Awning Basement Storage Hydraulic Jacks Electric Entry Step Basement Air Conditioning LP Leak Detector Furnace Gas & Electric Back-up Camera Onan 5500 Gas Generator w/ 266 Hours Driver Side Door w/power window Power Passenger & Driver Leather-like Seats Front & Back TV's Dash A/C & Heat / Dash AM-FM-CD Electric Leather-like Jack Knife Sleeper Sofa Leather-like Recliner Dinette w/ 2 Cushioned Benches (sleeping area)2-Sided Sink 3 Burner Stove/oven Microwave Oven Refrigerator/Freezer Private Toilet Sink w/ Mirrored Door Medicine Cabinet Shower with Skylight Mirrored Door Closet New Queen size mattress. New BatteryFire Extinguisher, Carbon Monoxide Detector & Smoke Alarm Comes with ManualsNew 50 Amp Surge Protector, Water Pressure RegulatorNew Tire Covers, NICE MOTOR HOME! This is a beautiful, clean and well-maintained two slide-out motorhome. It features leather captains chairs for driver and passenger, a swivel rocker, sleeper sofa, and convertible dinette to bed. The kitchen has solid surface counter tops and is equipped with a stove, refrigerator and microwave. The bathroom is spacious and has a tall shower stall with translucent sun roof, sink with vanity and porcelain toilet. The rear bedroom has a queen bed with space to walk around and large sliding door for complete privacy and spacious closets.